Recently I have been part of a recruitment effort for multiple roles. 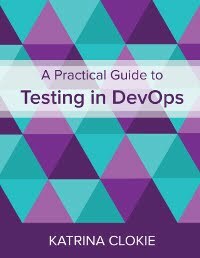 In May we posted two advertisements to the market: automation tester and infrastructure tester. Behind the scenes we had nine vacancies to fill. This was the first time that I had been involved in recruiting for such a large number of positions simultaneously. Fortunately I was working alongside a very talented person in our recruitment team, Trish Burgess, who had ideas about how to scale our approach. We left the start of the process untouched. There were just over 150 applications for the two advertisements that we posted and, after reading through the information provided, we sent three screening questions to a group of 50 candidates. We asked for responses to these questions by a deadline, at which point we selected who to interview. Usually we would run the two interviews separately. Each candidate would be requested to attend a behavioural interview first then, depending on the feedback from that, a practical interview as a second step. Scheduling for the interviews would be agreed between the recruiter, the interviewers, and the candidates on a case-by-case basis. As we were looking to fill nine vacancies, we knew that this approach wouldn't scale to the number of people that we wanted to meet. We decided to trial a different approach. Trish proposed that we run six parallel interview streams. To achieve this we would need twelve interviewers available at the same time - six behavioural and six practical - to conduct the interviews in pairs. The first hurdle was that we didn't have six people who were trained to run our practical interview, as we usually ran them one-by-one. I asked for volunteers to join our interview panel and was fortunate to have a number of testers come forward. I selected a panel of eight where four experienced interviewers were paired with four new interviewers. The extra pair gave us cover in case of unexpected absence or last minute conflicts. In the weeks leading up to the interviews themselves, the practical interviewer pairs conducted practice interviews with existing staff as a training exercise for the new interviewers. We also ran a session with all the behavioural interviewers to make sure that there was a consistent understanding of the purpose of the interview and that our questions were aligned. From the screening responses I selected 18 people to interview. 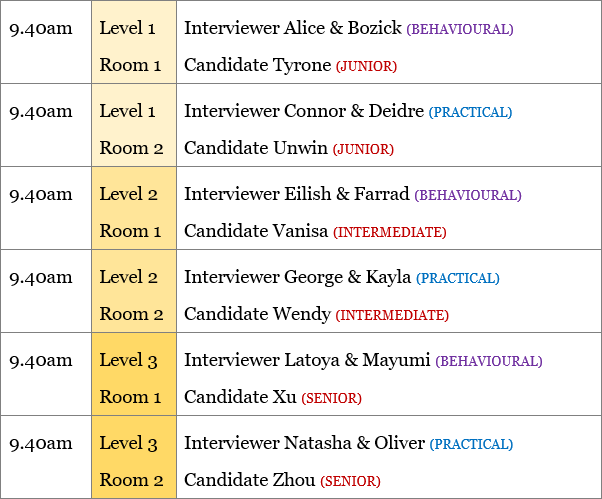 We decided to allocate the candidates by their experience into junior, intermediate, and senior streams, then look to run a consistent interview panel for each group. This meant that the same people met all of the junior candidates, and similarly at other levels. The easiest way to illustrate the scheduling is through an example. For the first session on Friday morning we asked the candidates to arrive slightly before 9.30am. Trish and I met them in the lobby, then took them to a shared space in our office to give them a short explanation of how we were running the interviews. I also took a photo of each candidate, which I used later in the process when collating feedback. Then we delivered the candidates to their interviewers. We gave the interviewers a few minutes together prior to the candidate arriving, for any last minute preparation, so the interviews formally began ten minutes after the start of their appointment (at 9.40am). 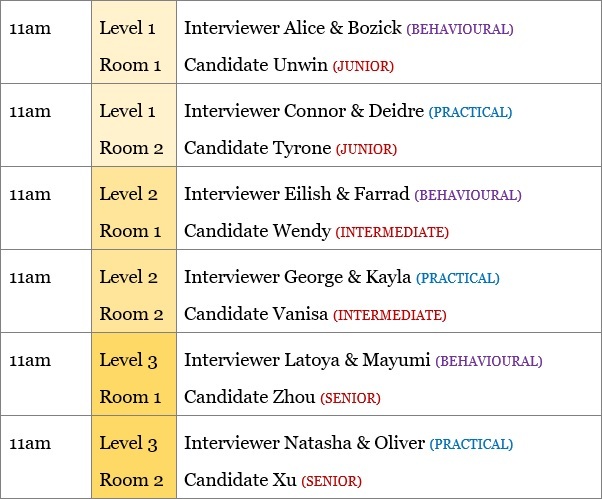 The first interviews finished by 10.40am, at which point the interviewers delivered the candidate back to the shared space. We provided morning tea and they had 20 minutes to relax prior to their next interview at 11am. Trish and I were present through the break and delivered the candidates back to the interviewers. The second interview session finished by 12pm, at which point the interviewers would farewell the candidate and collate their feedback from both sessions. The main benefit to people involved in the interview roadshow was that it happened within a relatively short time frame. Within four working days we conducted 36 interviews. As a candidate, this meant fast feedback on the outcome. As an interviewer, it meant less disruption of my day-to-day work. We were happily surprised that we had 18 candidates accept the interview offer immediately. We had assumed that some people would be unavailable, as when we schedule individual interviews there is a lot of back-and-forth. Trish had given an indication of the interview schedule when asking the screening questions. The set times seemed to motivate candidates make arrangements so that they could attend. By running two interviews in succession, the candidate only had to visit our organisation once. In our usual process recruitment process a candidate might visit twice: the first time for a behavioural interview and the second for a practical interview. One trip means fewer logistical concerns around transport, childcare, and leaving their current workplace. On the flip side, running two interviews in succession meant that people had to take more time away from their current role in order to participate. We had feedback from one candidate that it was a long time for them to spend away from the office. There were three areas that we may look to improve. Having six candidates together in the pre-interview briefing and refreshment break was awkward. These were people who didn't know each other, were competing for similar roles, and were in the midst of an intense interview process. The conversation among the group was often stilted or non-existent - though perhaps this is a positive thing for candidates who need silence to recharge? In our usual process the hiring manager would always meet the person that was applying for the vacancy in their team. In this situation, we had individual hiring managers who were looking for multiple roles at multiple levels - junior, intermediate, senior. With the interview roadshow approach, we had some successful candidates who were proposed to a role where the hiring manager hadn't met them. Though this worked well for us, as there was a high degree of trust among the interviewers, it may not in other situations. The other thing that became difficult in comparison to our usual approach was dealing with internal applicants. We had multiple applications from within the organisation and it was harder to handle these in a discrete way with such a large panel of interviewers. The roadshow approach to interviewing also made these people more visible in their aspirations, though we tried to place them in rooms that were away from busy areas. Overall, I don't think that we could have maintained the integrity of our interview process for such a large group of candidates by any other means. The benefits of scaling to an interview roadshow outweigh the drawbacks and it is something that I think we will adopt again in future, as required. I personally had a lot of fun in collating the candidate feedback, seeing which candidates succeeded, and suggesting how we could allocate people to teams. Though it is always hard to decline the candidates that are unsuccessful, I think we have a great set of testers coming in to join us as a result of this process and I'm looking forward to working with them. Nice to know the recruitment process of BNZ. Also it is very different from the general approach.